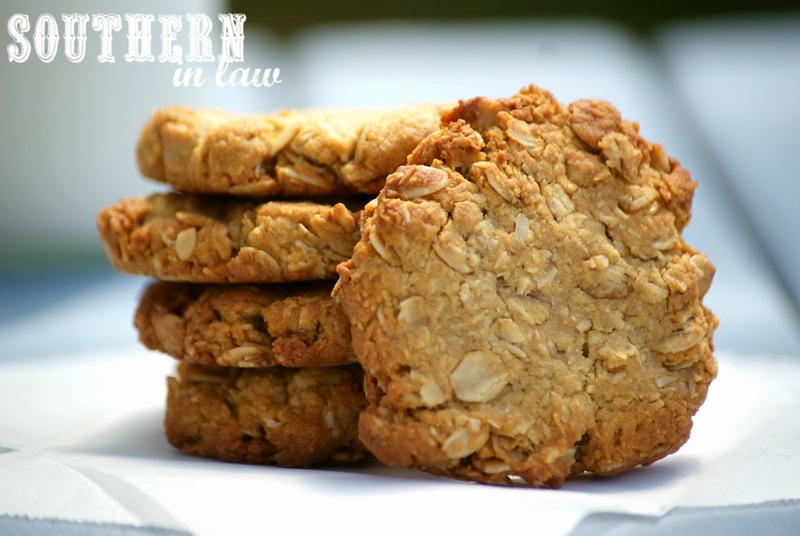 They use rolled oats, flour, dessicated coconut, sugar, butter, golden syrup, baking soda and boiling water, so they kept well during naval transportation and still arrived safe to eat (because you don't want to be the Mum responsible for killing your tough soldier son with a biscuit - right?). 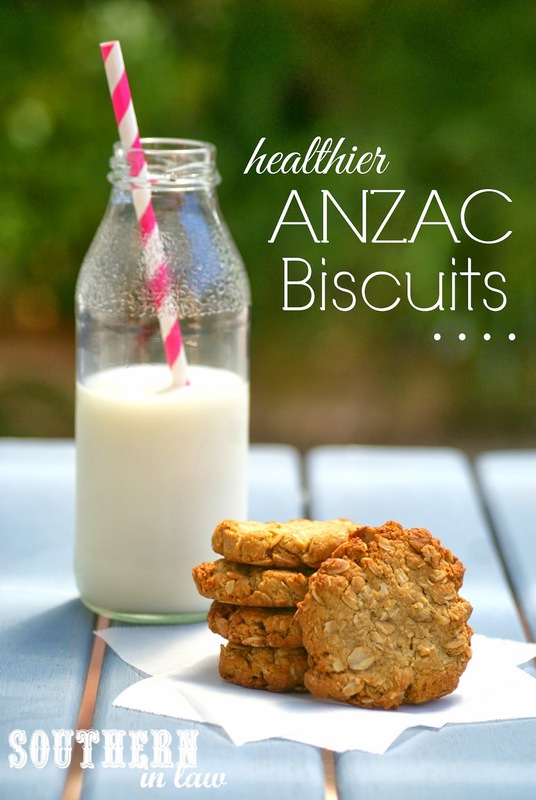 Needless to say, they're delicious - and my American husband is totally an ANZAC Biscuit fan! One of the biggest arguments for Australians is actually quite simple - crunchy vs soft. Some like their ANZAC Biscuits crunchy (SIL Mama is a crunchy only fan) whilst others like them soft (as Jesse, SIL Dad and I do). 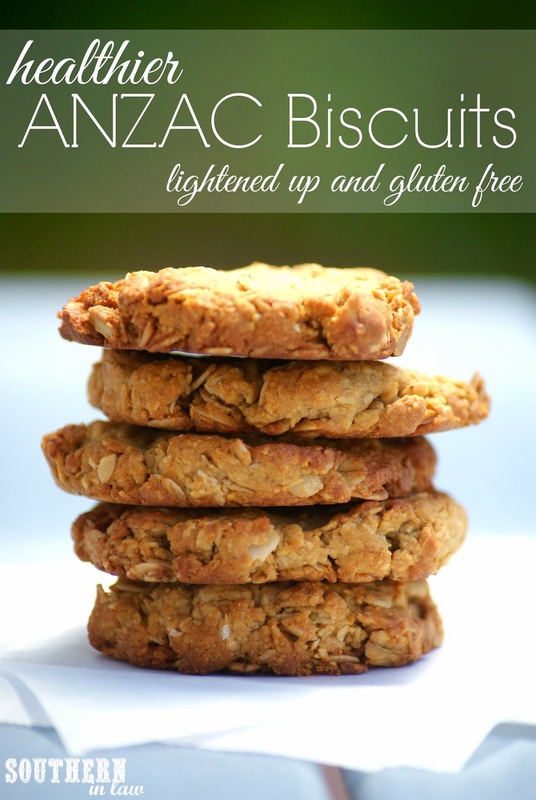 This recipe makes deliciously soft ANZAC biscuits but they can also be cooked longer for crunchy fans! ANZAC Biscuits traditionally use alot of butter.... that's why most people would describe them as "buttery", "moist" etc. But as you guys know, that's not how we do it here on Southern In-Law! I wanted to lighten up this Aussie classic, but still keep the classic taste, texture and feel - and oh, how I succeeded! These cookies didn't last long at all at our house... they were in a container on the bench and they were snaffled within a day or two. But that's how you know a recipe is good! I've converted the traditional recipe to be gluten free, low fat, lower sugar in a way that no one would even know they're better for you. Stove top method: place your butter, golden syrup and sugar in a small pot over a medium heat. Melt your butter and mix with your sugar and syrup. Once combined turn off the heat and add in your water and baking soda. Microwave method: add butter, golden syrup, sugar and water in a bowl and microwave on high in 20-30 second bursts until melted. Add in your baking soda. Combine your wet and dry ingredients, mixing until all combined. Drop your cookie mixture by tablespoons onto your baking sheet, leaving room for the cookies to spread slightly. Bake for 7-12 minutes, or until golden. Cookies will firm up once cooled. But tell me, crunchy, chewy or soft - how do you like your cookies? And what's one food you only eat on certain days of the year? We only ever ate lamingtons, damper or ANZAC biscuits on Australia Day and we only ever have Christmas Pudding at Christmas time. Oh my. This looks delicious and sounds delicious! I usually prefer my cookies to be soft and chewy. Then again, it depends on what type of cookie. The one thing I eat on certain days of the year is the Chinese New Year cake. Ooh, I've never heard of the Chinese New Year cake so I'll have to find out what exactly it is! Loving all of your Aussie-inspired baking this week, Kristy! 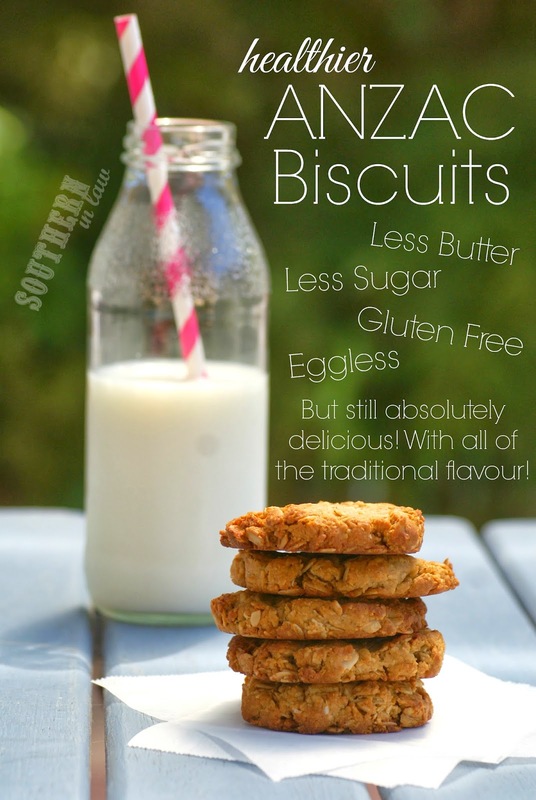 You know, I've only tried Anzac cookies once since moving here and really wasn't impressed. They were kind of bland and VERY crunchy...not my kind of cookie!! I think I'm going to give these a whirl over the weekend (as well as Lamingtons), and get into the Aussie Day spirit! Oh I promise these are DEFINITELY not bland or crunchy haha. That sounds awful! Nothing beats fresh beer battered fish and hot chips while sitting on the white sandy beach watching the sun go down on a hot summers night. wedding photo booth"Very superb information can be found on weblog ...I like your writing so much..Thanks for sharing nice blog !!!!!!!! Is golden syrup the same as, or similar to, maple syrup? That said, you can replace the golden syrup in this recipe with brown rice syrup or maple syrup - the flavour will be different, but they'll still be delicious! Nice Images.....This blog is really nice and even funny.I like it so much....Now a days photo booths are very popular for any kind of occasion and it is a part of entertainment.Theboothfairy also provide photo booth in Sydney.Recently i have also ordered a photo booth.They really provide very good services. Wow.. The photobooth work has undoubtedly increased the importance of the occasion to a great extent. My colleagues has suggested that shootingstarsphotobooths are quite explicit in their work. I am planning to spend the coming weekend at their photobooth along with my kids. Hey,nice idea.This is the ultimate Valentines Date!Who doesn't love being spoiled and feeling loved on this special day?!? !Included is bunches of great ideas that can be utilized any day of the year for any date.Love Hunt.Best Wishes. Love this! Making my jar now and that paper is so much cuter than Popsicle sticks! The paper is definitely much cuter - and takes up less space too! You can use just about any jar instead of having to find one to fit the sticks!